When Elizabeth Bennet is forced to remain at Pemberley due to her uncle’s accident and injuries, she does everything she can to prevent Mr. Darcy from realizing she is there. During those days she is successful in keeping her presence from his notice, she comes to learn more about him, his honorable character, and how well he is regarded by others. How long will she be able to keep her presence a secret from him, and what will happen when he finds out she is there? Mr. Darcy, meanwhile, is curious about the odd incidents taking place that he cannot explain. How will the reason he returned to Pemberley a day early affect him and those he cares about? Is the beautiful, accomplished, and admirable Miss Westerfield someone to whom he has already attached his affections? Does he truly intend to ask for her hand, as everyone believes? And how does the magpie play a role in the events of this story? Currently, the Kindle is available for pre-order, to be released Sept. 21. 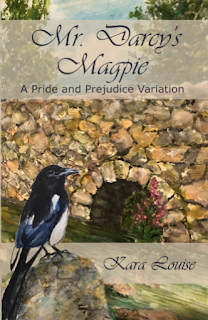 If you would like to read the first 15 chapters, go to Austen Variations here! Click on the title below to go to the book on Amazon.com. Watch for the release of "Mr. Darcy's Magpie" on Amazon, Barnes and Noble, Kobo, iBookstore, and other online sellers on and around September 21. Audiobook available at audible.com and amazon.com!